Showcasing your dishes in your kitchen is not a new concept. 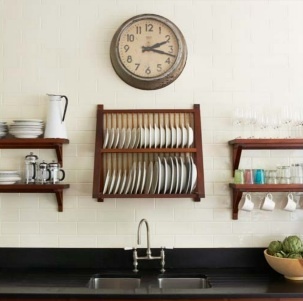 Besides the common open shelving, there are endless ways to display your dishes. 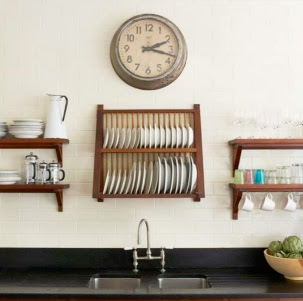 I love how this plate rack takes center stage along with this antique clock. All your dishes aren't pretty? Hide those ones behind closed doors. You don't have to pile your shelves high with dishes. Here, just a few everyday items are all that is needed to make food prep simple. 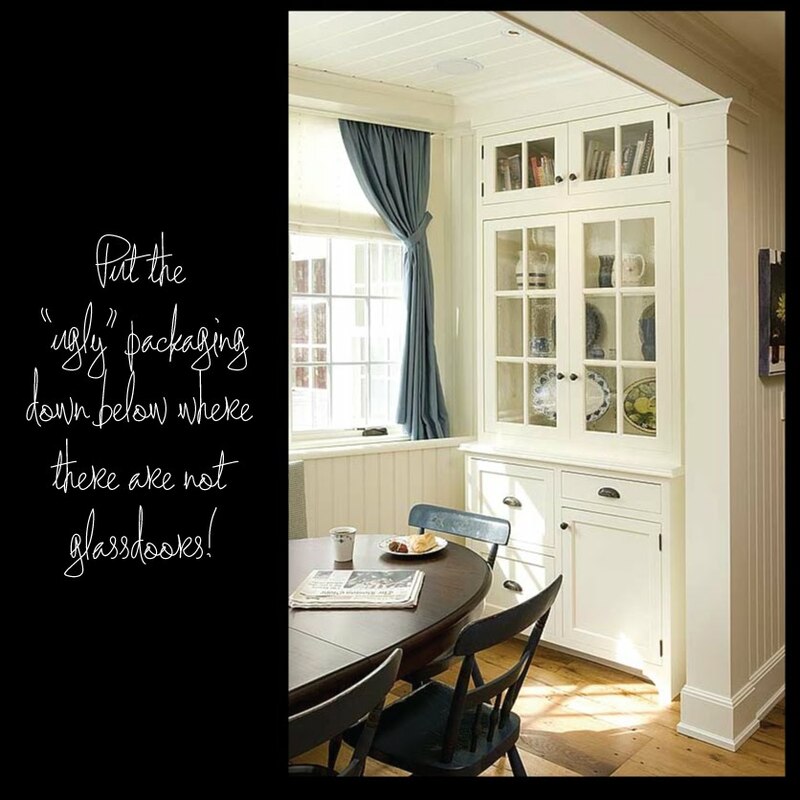 However, if you are short on storage space and don't mind the look, pile it on! Just make sure all your colors are neutral and don't compete with each other. This will help it to not look cluttered. I love all white dishes. I actually just got myself some new white dishes at the dollar tree. Yep, you heard me, and they are very nice I might add! I have to say I love this photo. just my cup of tea. You don't need to remodel your kitchen to achieve this look. Simply take off some of your cabinet doors, and voila~open shelving! I dream of a space like this. 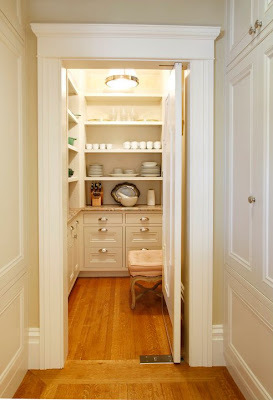 This photo was featured on Houzz today. I was really drawn to that slate blue color and the way the white dishes stand out against it. I love the second photo from the top. So nice! Open shelves are really nice, but it definitely requires coordinated (or intentionally mis-matched) china to make it work. 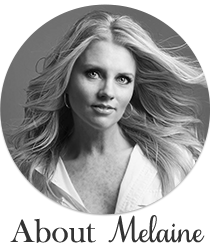 I'm currently repainting our kitchen cabinets and am trying to convince my husband that we should leave a few doors off and go with open shelving - thanks for some fabulous images to back me up, Melaine! I have open shelving and I love it. I have lower cabinets for large items, so I have to keep my everyday dishes on the open shelves. Using white keeps everything fresh and clean looking. Oh, and you have to keep it neat! I'm with you on this, I've got a wall in my kitchen slated for shelves. I love the dollar tree too,you can find a lot of cool things there. 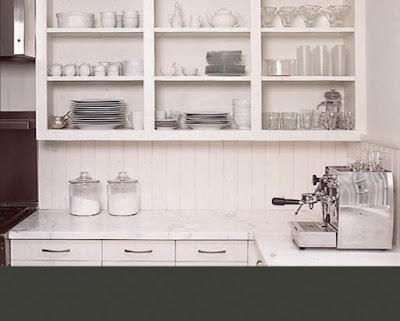 i looooove this look.... working on how to incorporate it in my own kitchen! I love your blog, but would much prefer it if you removed the audio player. It's not good to be at work and check a blog and then have music blast out of my computer. Not reader friendly. What a great looking cupboard you got there! 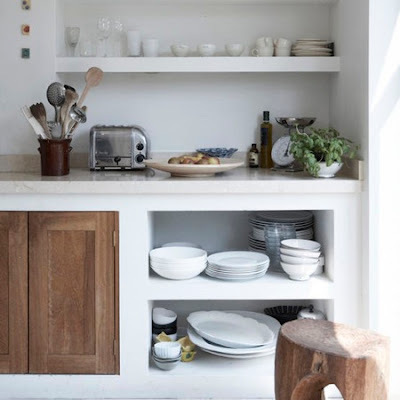 I also like the idea of open shelves. Love the pics...makes me want to put some more up tomorrow! I Like your music but if I am ever where i do not want it I know where the sound button is on my computer and turn off. Now my beef with you- Girl you made me fall in love with the Bodmer throws and in a weak moment ordered 2!!!! Yes 2, have I lost my mind? Even with the very nice discount (thank you by the way) I had to swallow hard. Can't wait to receive. I ordered the Tattersalls one like yours and a beige and cream plaid. Wish they were not so expensive and I would get a blanket for several beds. Great look and can't wait to snug down in soon. 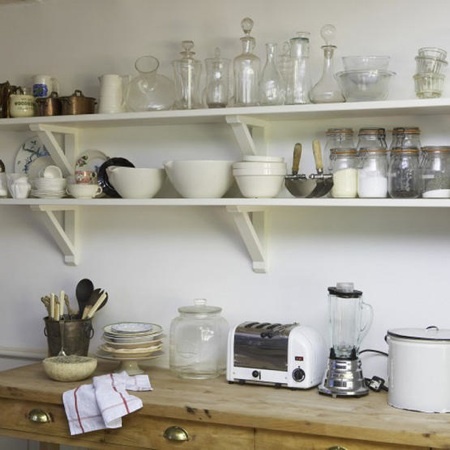 Love open shelving, but dont think it would work with me. I like my kitchen spaces to be free and clean...but I really want the open shelf look! I will just look on I think and smile at these. Hi lovely lady. 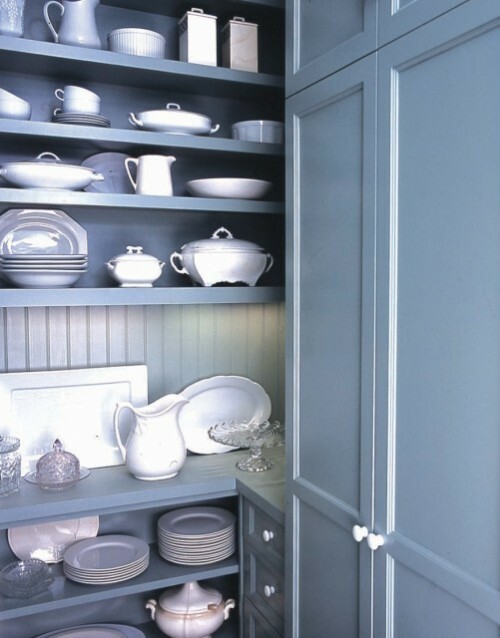 I love your open shelves for all your Beautiful China and it looks like this works for you great job !!! Im your newest follower on your lovely Blog. I hope you can comeover and join my blog also. I hope you have a nice day. 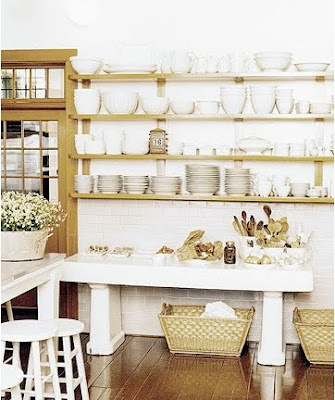 In my next house I would LOVE to have open shelves to display all dish and cute bowls...Love that look.